Keating Law Offices has successfully obtained a $20,000.00 settlement for an Oswego bicyclist injured in a bicycle vs. motor vehicle collision. The bicyclist was riding southwest bound on East Washington Street through its intersection with Monroe Street in Oswego on April 29, 2011. As the bicyclist entered the intersection, a motorist failed to yield to the right-of-way and struck the bicyclist with her care. The bicyclist suffered an injury to his tailbone that was very painful and required rounds of physical exams and therapy. The responding officer issued a failure-to-yield citation to the motorist. The motorist pled guilty to this citation, paid the corresponding fine, and very respectably wrote a letter to our client apologizing for the pain from the collision. The motorist admitted that she struck the bicyclist while looking over her shoulder and lecturing her child in the backseat. What might seem like an "open-and-shut" case because complicated when the insurance company would not acknowledge that the bicyclist's last round of physical therapy was as a result of this collision. The insurer claimed that, because there was a gap in time between the last doctor's visit and the physical therapy, that it must not be related. The reality is an insurance company has a responsibility to compensate a person injured when one of its "insureds" (the person who is covered by an insurance policy) causes personal injuries. However, most insurance companies refuse to cooperate easily. 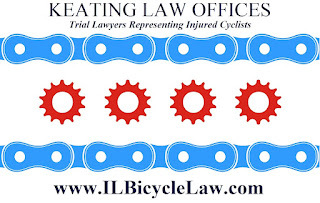 When faced with this ridiculous position the Illinois Bicycle Lawyers at Keating Law Offices immediately filed a lawsuit in the Circuit Court of DuPage County. The firm aggressively pursued the case and within months of the start of the case had gotten the judge in the case to rule that the motorist was absolutely at fault in the case. Once this was done, the insurance company had no choice but to offer more money to settle the case. At one point, the insurance company made an offer to settle that was the same as the judge's recommendation in the case. However, Attorney Mike Keating felt that the case was worth more to the bicyclist and refused to resolve the case despite the judge's instruction. This negotiation strategy was ultimately successful and the insurance company offered nearly triple the amount it originally offered in the end. The Illinois Bicycle Attorneys at Keating Law Offices are national leaders in the field of bicycle-related claims and lawsuits. 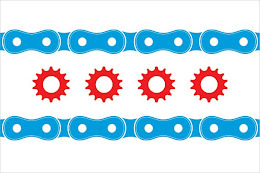 The firm is currently litigating more bicycle related cases in courtroom in Illinois than any other law firm in the state. In the process we have reached numerous successful settlements on behalf of injured bicyclists. 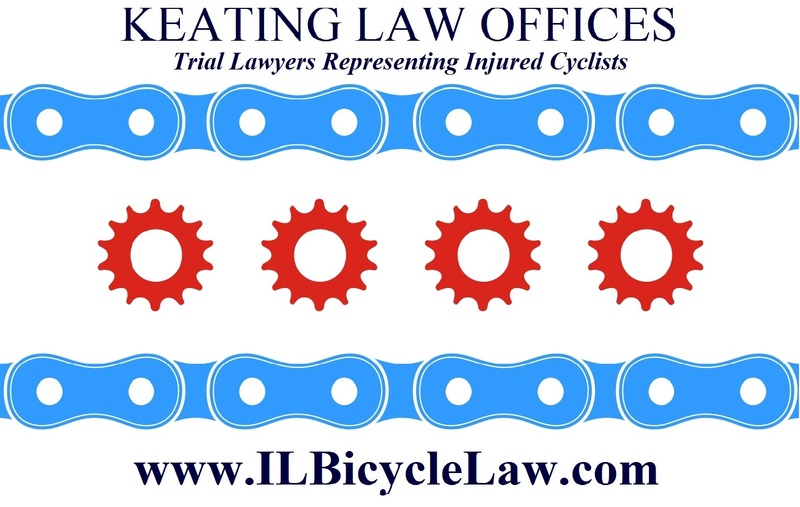 If you have any questions regarding Illinois personal injury law, please contact Illinois Bicycle Attorney Mike Keating at 312-208-7702 orMKeating@KeatingLegal.com 24 hours a day, 7 days a week. All e-mails and phone calls are returned promptly. All initial consultations are confidential and free.